So bright and delicious, you’ll love everything about this water recipe. You can pick up loose hibiscus at Whole Foods or any other health food store for about $1 an ounce. Only a teaspoon is needed to infuse your water with vibrant color and sweet, tangy hibiscus flavor. While plain watermelon water is delicious, hibiscus really jazzes this recipe up. 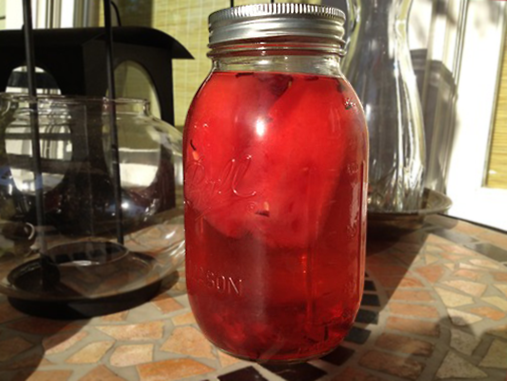 Recipe for a 32 oz glass jar: 2 1” x 4” pieces of watermelon and 1 tsp of dried hibiscus. Infuse for 1-4 hours in the refrigerator, then strain with a fine metal strainer before serving. My mom used to make hibiscus tea from dried or even the fresh one. She used boiled water like when we make other tea. 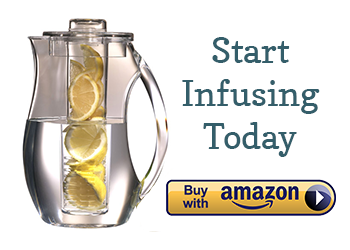 In this infused water recipes, do you use cool or hot water for dried hibiscus? I use cold or room temperature water for the hibiscus. Because you are letting the ingredients infuse for a few hours, there is plenty of time for the hibiscus to release its flavor. Typically with tea, we use hot water for faster flavor release. Fresh hibiscus sounds yummy! What if I’m using fresh hibiscus flowers…how should I use it? I live up north and don’t have access to fresh hibiscus, but it sounds fun to experiment with. Please keep up updated if you do try it! People in the Caribbean use fresh hibiscus for refreshing drinks. I normally used 20 flowers for a pitcher of drink for the kids. Add some lime juice or a piece of ginger for some zing and honey for sweetener. Delish!